Free Cycling eBook Promo is Going Great! Yesterday was quite a day, what with the Great Kindle eBook Experiment under way. This is the first time we’ve tried this and the numbers are gratifying. 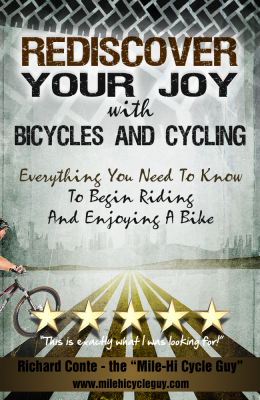 The book, Rediscover Your Joy with Bicycles and Cycling, went from a ranking of #4375 yesterday morning, to #691 this morning – that is out of more than 50,000 free Kindle eBooks at Amazon! And, we remain #1 in the Cycling category. For an obscure little cycling book, in such a specialized category, by an unkown author – ME – that sounds pretty good. Don’t you agree? To the more than 300 folks who’ve downloaded our little book – Thank You. We very much appreciate your interest. If you would be so kind, after you’ve read the book, please return to the Kindle store and write a review.We live for feedback. Riding a bike is a great way to spend time with family or friends, or to get to work, or run errands, while at the same time getting some great exercise. Why doesn’t everyone ride a bicycle nowadays? For one, they are intimidated when it comes time to buy a bicycle. Here are five helpful tips for choosing the perfect bike for you. Where will you be riding your bike? This question gets the ball rolling. There are bike shops, fitness stores and department stores all carrying bikes, but just a few main types of bikes: mountain bikes, road bikes, hybrid bikes, and cruiser bikes. How often you will ride and the route you choose determines the best type of bicycle for you. How tall are you? This factor is important because a short person doesn’t want to have a bike that will cause them to hit the crossbar, or top tube, every time they try to stop the bike. A bike that is the wrong size for you can mean cramped legs and sore knees or stretched muscles. For the answer to this question, you’ll actually have to sit on a bike, or at least stand over one, to check for clearance. Ride a bike. Don’t let the first bike you ride be the one you purchase from the store. Try different models and types or, ask a bike riding friend to borrow their bike to “test drive,” in advance. Most bike shops will also rent you a bike. Try a couple of different types, if you like, to see how they handle and feel. Buy the best bike you can afford the first time. In a recession especially, people have the tendency to stay on the cheap side. However, there are some things that don’t pair well with “cheap.” A bike and a car fall into that category. You will be riding this bike alone or perhaps with a carrier for your child. You want to know that you can depend on your bike to keep you safe while you ride. You don’t have to spend a thousand bucks to get a good bike, but try to get all the features you need for the best possible price. However, as with most things, you get what you pay for when you buy a bike. As a way to celebrate the Big Bicycle Race in Colorado this week, the USA Pro Cycling Challenge, I have decided to offer the new Kindle version of my cycling eBook for FREE. The book may be downloaded, free of charge, for the final weekend of the race, beginning Friday, August 24th through Sunday, August 26th. You could really help me kick off this promotion for the book if you could tell as many people as possible about this free download. Here is the link to the FREE Kindle Download: Rediscover Your Joy with Bicycles and Cycling. The book is a great way to help your friends and family get started or return to cycling, with everything you, or they, need to know to begin riding and enjoying a bike. Learn what, and how, to ride with joy today. As children, the ability to experience joy was a constant in our lives. As adults, we tend to lose this sense of joy. Cycling renews this ability, allowing a sense of freedom and joy unlike virtually any other activity available to us in today’s high-tech, high stress world. The almost childish rush of freedom and pleasure which is inherent to cycling makes it easy to enjoy, and continue enjoying, regardless of whether we ride simply for pleasure, or for a purpose; such as, commuting to work, running errands, exercise, racing or for any other reason. Exercise with a purpose can be one of the most rewarding motivations for regular riding. Cycling to work while burning excess calories, for instance, is its own reward. Thanks for your help, and I will let you know how we did when the promotion is finished!